Yea- you need little kittens to take care of. They're very cute though and I am quite partial to calicos myself. Have fun! 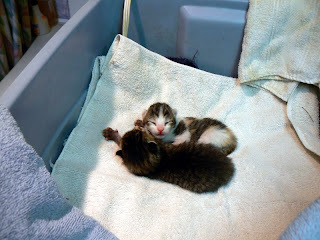 Little kittens are doing well - knock on wood! - Toby the Tabby, and (as yet unnamed) the Calico. Winnie has enthusiastically taken over cleaning them - only closely supervised! the kittens stay cradled in our hands. 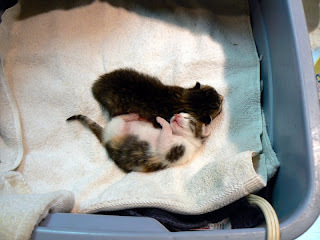 Bottle feeding is going well and they're both gaining, and eliminating. Kitten feeding has dovetailed nicely with barn checks - those ewes have to give up the lambs sometime!